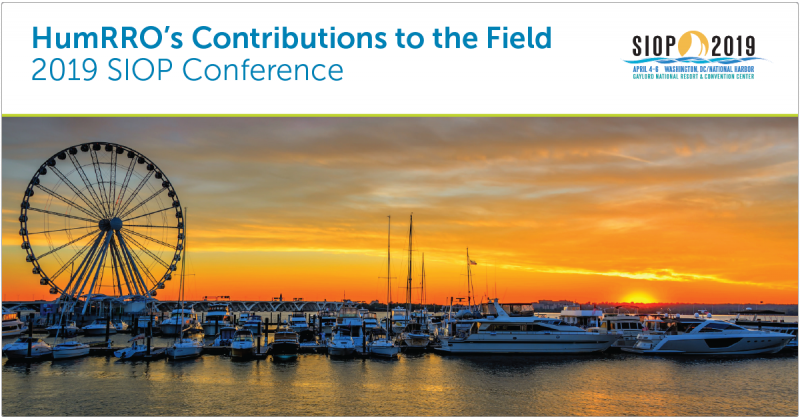 Continuing our many contributions to science over the years, HumRRO staff are giving over 25 presentations at the 2019 Society for Industrial and Organizational Psychology (SIOP) Conference at National Harbor, MD on April 4-9, 2019. Our presentations focus on a variety of topics including talent management, assessment, diversity, cyber careers, and artificial intelligence/machine learning. In addition to these presentations, HumRRO staff are engaged with SIOP through numerous committees including Workshops, Visibility, External Relations, Professional Practice, and Mentoring. If you are attending the conference this year, check out our presentations!